The following is part three of a blog on the current situation in the Central African Republic (CAR). You can find part one by clicking here and part two here. Finally, the long-promised EU Mission to the Central African Republic will be deployed. The 1st of April marked the beginning of the operation. The EU said that it would send troops to the embattled African nation “rapidly, so as to have immediate effects,” however it did not provide a timeline for their deployment (the deployment can be expected for May 2014). It has been delayed because of insufficient troop and aircraft commitments by the EU’s 28 member states. The force will comprise up to 1000 troops, led by Major-General Philippe Pontiès (France) as EU Operation Commander. Its Operation Headquarters is located in Larissa, Greece, while the Force Headquarters and the troops will be located in Bangui. The common costs of the operation are estimated at € 25.9 million for the preparatory phase and a mandate of up to six months starting from the point of reaching full operational capability. The EUFOR troops will deploy rapidly so as to have immediate effects in the operation’s area of responsibility. The police and troops will be provided by thirteen nations: France, Estonia, Latvia, Spain, Portugal, Germany, Poland, Italy, Finland, Sweden, United Kingdom, Greece and Georgia. Because of the recent Ukrainian Crisis, Romania reconsidered its engagement, while the Polish commitment has been limited. The EU Mission will assist the 2000 French troops (Sangaris) and the 6000 AU Troops (MISCA) while the UN is in the process of putting together a 12 000 strong peacekeeping force (Due to be approved by the UNSC on the week of the 14th of April), which could be ready for September and take over the EU mission and AU mission if not extended. However, the “hard” job still remains to be done. General Philippe Ponties, commander of EUFOR CAR, reminded that the mission faces challenges and that it will embark on a dangerous task. The situation in CAR remains tense and highly insecure. Peter Bouckaert, Human Rights Watch’s emergencies director and an expert in humanitarian crises,informed ISIS Europe that the “EU Mission is really important to stabilize and to police Bangui and it will give the opportunity to French troops to be freed up and secure the countryside of the CAR”. He added that EU military assistance is much anticipated, but that people wonder why it is taking so long as it is in a way “Hurting (to see) how quickly the EU answered to Ukraine but not to the CAR – questioning the EU commitment in crisis in Africa”. Catherine Ashton said that “it is vital that there is a return to public order as soon as possible, so that the political transition process can be put back on track,” in other words, how to state the obvious. The mission is also limited in time, as the situation in CAR, while not new on the African continent, remains tricky and difficult. The European troops and police are unlikely to make a difference on a short term (6 months). Problems in CAR are based on sectarian violence and to properly secure some areas requires a long and lasting learning process from the local populations, both Muslims and Christians. Being realistic, the problems on the ground are deep-seated and they are not going to fly away in a hurry. Once the UN takes over, the EU should redefine its mandate, allowing the security aspect to be handled by the UN and taking care of the police and the civilian missions, as well as capacity building. It would not make sense to see the EU leaving after only 6 months. Millions of people have been displaced; hate between the two communities has grown during the past years, so trust will take time to return in CAR; trust towards the peacekeepers and other foreign forces, trust between the Muslims and Christians and trust towards the future national administration. The 81 million euros that the European Commission has pledged in new development funds can achieve substantial impact, but only if they reach the targeted areas and issues; consolidate stability, help the local organization and bring security to human rights organizations on the ground. It is not only one country to secure, but the region and European forces need to be trusted by the population. However, the mere presence of an EU operation will have a calming effect, amplifying the direct action they will take to protect the most vulnerable civilians. Hoping/expecting that the mandate will evolve into a capacity building one once the UN troops will be on the ground, the “authorities” of the CAR need immediate support to their legal structures to address impunity (which will bring trust) and to develop a new administration. Peter Bouckaert reminded ISIS that Catherine Samba Panza is the Interim president of a country which doesn’t exist, she doesn’t have a presence in the country, she is working with an administration which does not have any logistical and communicative means. The challenge is tremendous and it explains why the interim President, and the different missions struggled to contain the violence. 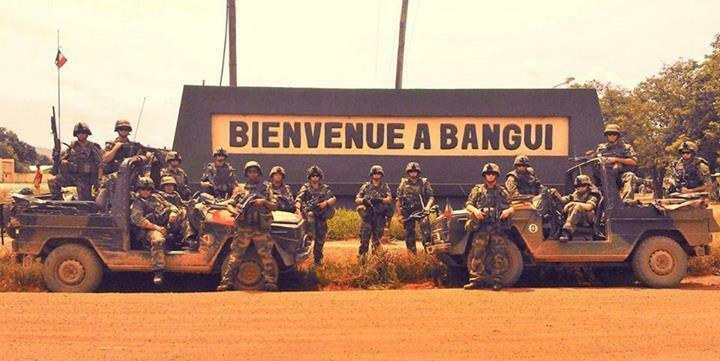 According to Bouckaert, “France did not find a solution to dealing with the Anti-Balaka as they [French troops] continue to be faced with a messy situation on the ground”. He also added that the French message to the international community is contradictory, as the French were desperate to garner support from other countries, showing signs of loneliness and overwhelming, while at the same time displaying the success of their intervention in CAR. 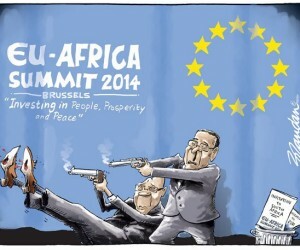 Is the EU still (re)discovering Africa? Even if the latest EU-Africa Summit held in Brussels in April 2014 focused mainly on trade between the two continents, there is a need to see concrete results regarding peace and security. Problems seem to be the same and obviously unsolved, but political statements remain positive. While repeating the continent’s importance and the common ground it shared with Europe, the EU is making a move from being a soft-power to a statement expert. President of the European Commission, Jose Manuel Barroso, said that both continents were also obliged to cooperate with one another because of the common problems they shared: “If terrorism spreads in the Sahel or on the Horn of Africa, or refugee flows become uncontrollable, then that is a threat for Africa as well for Europe,” again an obvious but also selfish statement. It might be time to stop pretending to act for Africa. It is high time to make things more concrete, efficient and realistic and to start rethinking the basis of the EU-Africa partnerships. Even if both sides agreed in principle that Africa should solve its own problems and that includes security issues, African Union President Mohamed Ould Abdel Aziz admitted that “even when we have troops who can intervene in a crisis, we lack transport and deployment capabilities. This is where the European Union plays an important role”. However, the EU has played this role many times and did not manage in the past, to keep it up for reasons such as the financial crisis, other priorities and areas of conflict but also because of a general “fatigue”, all important excuses to not see concrete results. There is today a “dangerous” triangle which would benefit none of the main actors. The EU is financing, The UN is managing and the AU is fighting. It needs to go beyond this, as it is clear it did not bring satisfaction in previous years regarding peace and security issues. The EU has been too ambitious with the AU at the beginning and there is a need to focus on realistic improvements instead of pressuring the AU. However, the AU also needs to start being proactive. “Since 2002 the African Peace and Security Architecture (APSA) has emerged, led by the African Union and the Regional Economic Communities. APSA is a framework consisting of formal legal agreements, institutions and decision-making processes, which together handle prevention, management and resolution of conflicts in Africa. Key components include the Peace and Security Council, the Panel of the Wise, African Standby Forces, the African Peace Fund and the Continental Early Warning System. An interesting paper form the European Think-Tanks Group could explain more about the situation but what is worrying is that the declarations of the last summit in Brussels did not evolve much since Lisbon 2007 and the African-EU Joint Strategy. 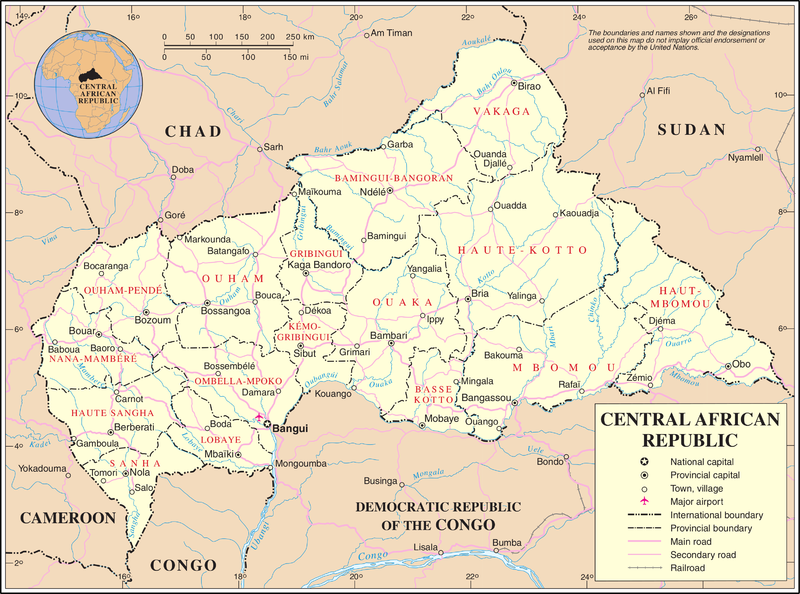 Chad is the Central African region’s dominant military power, as the world has already witnessed in Mali and Sudan. Chad has around 850 soldiers serving in the peacekeeping force in CAR (15% of MISCA forces). There are also Chadian Special Forces operating in Central African Republic who are outside the mandate of the peacekeeping mission. Chad has been a key player in the Central African Republic crisis that deepened in December when the country shattered into sectarian bloodshed. Chad’s forces have been instrumental in the effort to evacuate Muslims across the northern border into Chad, a predominantly Muslim nation, with the help of its peacekeepers. However, Chad and its president have long played a complicated role in the crisis with its southern neighbor Central African Republic. While Chadian troops helped bolster the now-ousted government of Francois Bozize in Central African Republic, Chadian mercenary fighters helped Muslim rebels overthrow his government in March 2013 and have carried out atrocities since. Chad’s troops have been accused of siding with the mainly Muslim Séléka rebels whose seizure of power last year led to violence with the Christian militia. Reports mention involvement of Chadian troops in a series of violent incidents. In the beginning of April 2014, a U.N. report accused its soldiers of killing 30 civilians and wounding 300 in an attack on a crowded market last week and CAR’s interim president Catherine Samba Panza, who succeeded Séléka leader Michel Djotodia when he stepped down in January under international pressure, announced in Brussels the opening of an investigation. As a result, Chad’s Foreign Minister Moussa Faki Mahamat denied the allegation, saying the troops had been ambushed by Christian “Anti-Balaka” militia and had responded. SCA General Jean-Marie Michel Mokoko also mentioned that the Chadian soldiers acted after being targeted by Anti-Balaka. 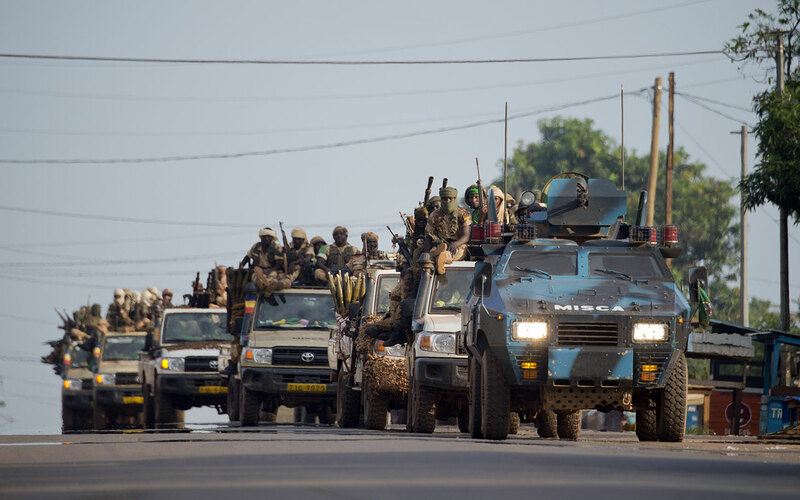 Conclusion, Chad began withdrawing its troops from Central African Republic’s peacekeeping mission MISCA. The U.N. human rights office carried out a preliminary investigation, interviewing survivors in hospital and visiting the scene of the March 29 attack. Spokesman Rupert Colville said a convoy of pick-up trucks from Chad’s regular army entered the market in the capital’s PK12 district and started firing. While Chadian troops participated in the African Union force deployed in Central African Republic, the soldiers were not part of the peacekeeping contingent, the investigation found. Bouckaert confirmed to ISIS Europe that he witnessed Chadian troops helping Séléka officers and confirmed the presence of Chadian Special Forces not being part of the MISCA. He added, during an interview that “They consider themselves the saviors of the Central African Republic who’ve evacuated so many tens of thousands of Muslims and any kind of criticism is just unacceptable from their point of view…Their role is very important in the Central African Republic but at the same time a situation where they can just do as they please and fire on the civilian population and facilitate Séléka movements is just not acceptable.” That said, civil society groups have collected 240,000 signatures for a petition seeking the withdrawal of the Chadian troops. CAR is located in a fragile region, with many neighbors who are themselves recovering from conflict and many families are fleeing into neighboring countries like Chad, Cameroon, Congo, and not to mention Sudan. With a series of political and governance failures dangerously recast as a conflict between Muslims and Christians, the risk that the fighting becomes entrenched and spills over into neighboring countries increases the longer it takes for security and reconciliation to be established. The consequences of the withdrawal of Chadian troops can be interpreted at a national and regional level. First, the Muslim population, who still live in CAR and who do not trust much the French troops will start to feel unprotected. At a regional level, the withdrawal is a disaster for France as it creates tensions in the region and France needs Chadian support regarding the conflict and the necessity to maintain peace in Mali. One of the main problems in CAR is that the violence is extreme but also often random. Peter Bouckaert said to ISIS Europe that the EU troops have to be warned as CAR is a complex theater of extreme and unpredictable violence which can turn in a traumatizing experience for some of the EU military on the ground. Peter Bouckaert witnessed some atrocities on the ground. – Early February 2014, French Defence Minister Le Drian and Interim President Panza made the city of M’Baiki the city of reconciliation between the Christians and the Muslims. Two weeks later, the very last Muslim of the city was killed. – In February 2014, few minutes after the Interim President gave a speech during a ceremony to re-launch the national army; soldiers burned and mutilated the body of a Muslim in front of the international press. 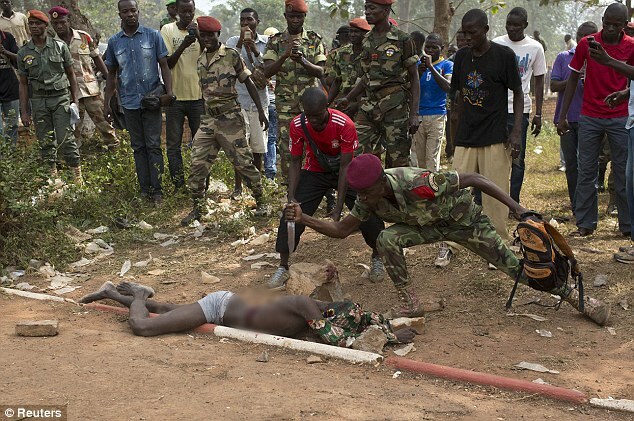 – In March, on his way back to Bangui, he witnessed an Anti-Balaka parading with a leg of a Muslim and saw other Anti-Balaka throwing fresh body parts at the Sangaris Troops. The troops on the ground are going to face many provocations as the Anti-Balaka know the rules of engagement and are consequently not scared to come under fire from peacekeepers. One of the main problems which has to be urgently solved is to facilitate the work of humanitarian workers; “For everyone in this country, security is a challenge, because (the situation has) been very volatile and violent… Last year there were nine humanitarian workers who lost their lives,” said Judith Léveillée, deputy representative for the U.N. children’s agency UNICEF in the CAR. Clearly the situation itself is not positive, as Bouckaert reminded ISIS Europe that nowadays, the violence is not only between Muslims and Christians; there is now arms trafficking and circulating, a new weapons market, political actors who want to regain position or new ones. A significant part of the population is involved and they are not traditional military actors and until now, the international community failed to come up with a proactive intervention to stop violence against Muslim communities. However, there is a way to reconcile the population. There is extreme violence in Bangui, but also in other cities and in some of them, peacekeepers or even the Catholic Church have managed to bring land peace between villages. Bouckaert is convinced that the violence can be stopped. It requires patience and calm but he explained to ISIS Europe that it is important to show to the population that the criminals will be prosecuted, that it is important for the community to live together, “to stop to kill your neighbor”, and that the Muslim population is not only a religious one but also a business community. Without their presence, the market is no longer operating and the goods not being imported. A conclusion that essentially states that: you need your neighbor to not hurt yourself. This entry was posted on 11/04/2014 by ISIS Europe in Contributors, François Ducrotté, Opinions.